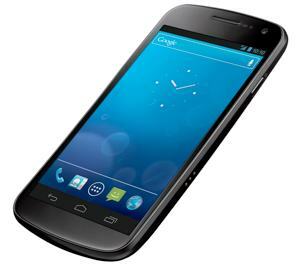 The world's first smartphone running on Android 4.0 (a.k.a., Ice Cream Sandwich), the 4G LTE enabled Galaxy Nexus by Samsung for Verizon brings a redesigned user interface with enhanced multitasking, notifications, full Web browsing experience, and more. You'll also enjoy innovative, next-gen features such as Face Unlock, which uses facial recognition to unlock the Galaxy Nexus. The Galaxy Nexus is outfitted with a 4.65-inch HD Super AMOLED Contour Display (with curved glass), 5-megapixel camera with zero shutter lag and Full HD 1080p video recording, and a front-facing 1.3-megapixel camera for video calls on the go. It's powered by a dual-core 1.2 GHz processor that speeds up your web browsing, gaming, and multitasking. The Verizon Wireless 4G LTE Mobile Broadband network provides speeds up to 10 times faster than Verizon Wireless' 3G network. With 4G LTE, you'll enjoy simultaneous voice and data capabilities, allowing you to check e-mail, browse the web, download an app, and check directions on Google Maps while on a call. You can expect fast download speeds of 5 to 12 megabits per second (Mbps) and upload speeds of 2 to 5 Mbps in 4G LTE mobile broadband coverage areas (learn more about 4G below). You can share your high-speed 4G LTE connectivity with multiple devices--laptop, another phone, MP3 player, and more--via Wi-Fi using the built-in Mobile Hotspot functionality (additional service charge applicable). And the Galaxy Nexus is outfitted with ultra-fast Wireless-N Wi-Fi networking as well as next-generation Bluetooth 3.0 connectivity. The new Android Beam feature (using NFC connectivity) allows you to quickly share Web pages, apps, and YouTube videos with friends by simply tapping compatible phones together. You'll also enjoy easy access to a full complement of Google mobile services, including Gmail, Google Maps 5.0 with 3D maps, syncing with Google Calendar, a redesigned Google＋ app, and access to more than 300,000 apps in the Android Market. Other features include a virtual onscreen QWERTY keyboard with enhanced auto-correction and touch recognition for a more natural feel, 32 GB of internal memory, 1 GB of RAM, and up to 12 hours of talk time. The Galaxy Nexus has a full-featured 5-megepixel camera with automatic focus, top-notch low-light performance, and zero shutter lag. Open it right from your lock screen, and fire off a photo instantly. You can also take beautiful panorama pictures--just point and touch the shutter and pan your phone from one side to another. Android immediately stitches together an expansive panorama photo, ready to share. A full-featured photo editor lets you add filters and effects, adjust color, straighten, reduce red eye, crop, rotate, flip, and even doodle on your favorite photos--right after you take them. Your edits are saved as a copy, so you can always get to the original. Your photos can upload themselves with Instant Upload, which makes it much easier to share them with family and friends. If you've signed up for Google+, you can enable Instant Upload and share photos with anyone you choose. Shoot video in Full HD 1080p, and snap still shots while you're at it. Continuous focus, real-time zoom, and time-lapse mode give you the power to shoot stunning videos. When your footage is ready, create your own movie with Movie Studio and upload it to YouTube. When you shoot videos, you can choose from a number of silly faces and other fun effects. Galaxy Nexus is smart enough to recognize individual facial features--give your friends big eyes, squeeze heads, make noses bigger. Or change the scenery with background replacement. 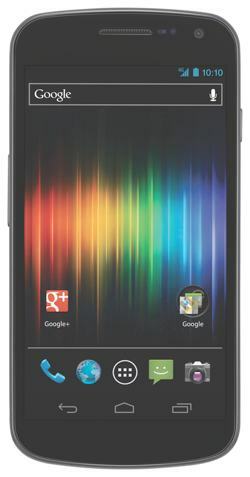 The Galaxy Nexus by Samsung weighs 5.29 ounces and measures 5.33 x 2.67 x 0.37 inches. Its 1850 mAh lithium-ion battery is rated at up to 12 hours of talk time and up to 150 hours (6.25 days) of standby time. It runs on the Verizon Wireless 4G LTE network, as well as EV-DO, Rev A 3G and CDMA 800/1900 frequencies where 4G LTE is not available. The Galaxy Nexus runs the Android 4.0 operating system (dubbed Ice Cream Sandwich), which adds powerful new ways of communicating and sharing while improving on the best Android features: easy multitasking, rich notifications, customizable home screens, resizable widgets, and more. Ultra-fast 4G LTE connectivity via the Verizon Wireless 4G Mobile Broadband network, with expected download speeds of 5 to 12 Mbps and upload speeds of 2 to 5 Mbps. Where the 4G LTE network is unavailable, the phone will connect with the Verizon Wireless 3G network. Wireless-N Wi-Fi networking (802.11 a/b/g/n) for accessing home and corporate networks as well as hotspots while on the go. 4G Mobile Hotspot capability allows you to create a Wi-Fi hotspot using your Verizon Wireless 4G LTE connection, which can then be shared among up to 10 Wi-Fi-capable devices (up to 10 devices on 3G). Android Beam for sharing contacts, web pages, directions, and more via Android Beam to compatible phones. Personal and corporate e-mail access with support for Exchange ActiveSync as well as mobile e-mail accounts (Google push, Yahoo!, POP3, IMAP). Dual-core 1.2 GHz processor capable of opening web pages twice as fast as most other smartphones. 4.65-inch HD Super AMOLED multi-touch screen (1280 x 720 pixels) with Contoured Display. 5-megapixel camera with continuous auto focus, zero shutter lag, single-motion panoramic mode, and LED flash. Full HD 1080p video capture with on-phone movie editing and easy upload to YouTube. Front-facing 1.3-megapixel camera for video chats and self portraits.